Andrew Quanbeck, PhD, a systems engineer and health services researcher, joined the DFMCH in March. His work focuses on ways to improve adoption evidence-based practices in primary care. How can primary-care physicians adapt clinic practice to better meet clinical guidelines for opioid prescribing and ultimately reduce the prevalence of opioid addiction and misuse? Andrew Quanbeck, PhD, a systems engineer and health services researcher who joined the UW Department of Family Medicine and Community Health (DFMCH) in March 2017, thinks that some answers may lie in implementation science—a discipline that uses evidence-based methods to bridge the gap between research findings and real-world practice. Dr. Quanbeck comes to the DFMCH after serving as an associate scientist in the UW College of Engineering’s Center for Health Enhancement System Studies (CHESS). There, he worked closely with David Gustafson, PhD, the Center’s principal investigator and a national expert in the use of quality improvement and technology to improve health. 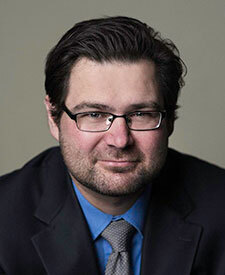 While earning his PhD, he was the scientific manager of the NIATx 200 study, a National Institute on Drug Abuse-funded randomized trial of a model for improving patient access and retention in addiction treatment centers. Dr. Quanbeck is currently the principal investigator (PI) on two National Institutes of Health-funded research grants. On one, he’s collaborating with the DFMCH’s Randy Brown, MD, PhD, FASAM (co-PI), Aleksandra Zgierska, MD, PhD (co-I), and Brienna Deyo, MPH (project manager), to pilot-test a strategy to improve the opioid refill process at primary-care clinics. First, the team worked with writers of the 2009 clinical guidelines on opioid prescribing for chronic pain to distill the guidelines into a succinct implementation guide. The team then recruited eight UW Health primary-care clinics (four intervention, four control) to participate in an initial feasibility study. Prescribers and clinical teams at the intervention clinics received six months of coaching on the new workflow; prescribers and teams at the control clinics received no intervention. Initial results are promising: staff at the intervention clinics believed they were more familiar with guidelines for safe opioid prescribing, and that their clinic’s workflow for opioid prescribing was easier. Intervention clinics also demonstrated reductions in average morphine equivalent daily dose and increases in mental health screening rates. A complete paper is in development. In June, Dr. Quanbeck presented preliminary results in an oral presentation at the 2017 AcademyHealth Annual Research Meeting, one of the preeminent academic conferences for health services researchers. He was also selected to participate in a separate “Best of the Annual Research Meeting” panel discussion at the same meeting, an honor reserved for the seven highest rated abstracts of more than 2000 submitted for the conference. Dr. Quanbeck’s other funded research project, an NIH K01 Mentored Research Scientist Career Award, underpins his overall focus on strategies to improve adoption of best practices in addiction treatment. Specifically, he’s developing and testing a model of decision analysis to assess how health-care stakeholders perceive the value of evidence-based practices. For example, he explained that in the context of primary care, a clinic medical director may have resource constraints that prevent adoption of a guideline or intervention. Individual clinicians or staff may be constrained by time. A patient may be constrained by other factors, such as access to care or social support. Successful implementation requires that those perspectives be examined in a systematic way, and that the benefits of adopting the change exceed the costs for all stakeholders. He’s developing and testing his model in three primary care clinics that implemented Addiction CHESS (ACHESS), a smartphone-based relapse prevention system developed to support people with alcohol addiction. Over the long term, he hopes to apply this decision-analysis model to other interventions to determine their potential for implementation.